RICHMOND, Va. — A bill that would stiffen penalties for those who murder a law enforcement officer is another step closer to becoming law. The Senate voted 34-5 Monday to pass Senate bill 1501. It now heads to the House. The bill was inspired by the murder of Special Agent Mike Walter who was shot while on patrol in the city of Richmond May 26, 2017. Senator Bill Carrico and Delegate Todd Pillion heard Jaime’s pleas for change and drafted companion bills that would prohibit the reduction of a capital murder charge when it involves a law enforcement officer. The House version of the bill, which was amended to include all Capital offenses and not just when it involves law enforcement, advanced to its third reading on Monday. It will be voted on Tuesday. “Mike would say you got this. I believe that he’s here with me right now pushing me and guiding me and holding my hand and I think he’s doing that for all of us,” she added. Widows of fallen troopers have been testifying to show their support of the bill. Including Walter, Michelle Dermyer and Betty Walker. 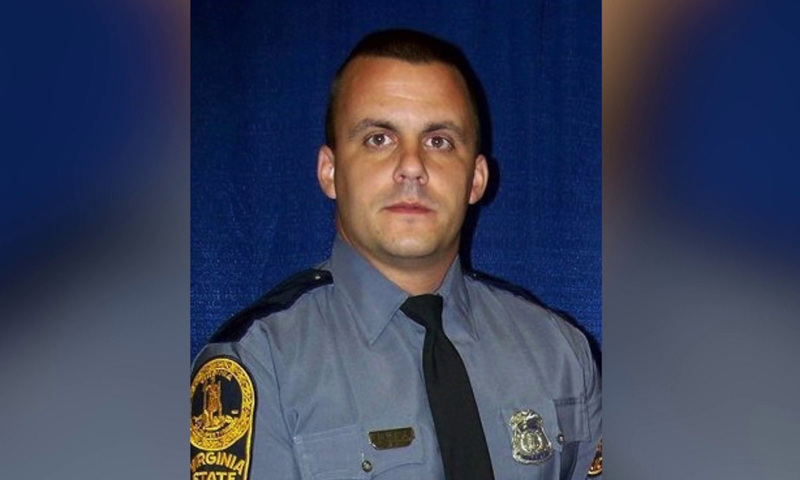 Trooper Chad Dermyer was fatally shot during a training exercise at the Greyhound station in Richmond in March 2016. Master Trooper Junius Walker was shot on Interstate 85 in Dinwiddie in March 2013. Carrico is a retired Virginia State Police senior trooper who patrolled the same streets as Mike Walter. “I’ve walked in their shoes I’ve stood in Mosby and Gilpin Court, I worked undercover for a year in the city of Richmond I know what it’s like,” said Carrico. Carrico also has a son who is a member of the Virginia State Police tactical team. “This can be problematic in many ways one is it could tie the hands of a Commonwealth’s attorney,” said CBS 6 legal analyst and former prosecutor Todd Stone. “That’s not really an appropriate thing for the General Assembly to be doing because only a prosecutor knows what their evidence establishes and what it can prove if they go to trial and taking that discretion away from prosecutors makes the system less efficient,” Stone added. “When a police officer gets killed it’s a horrible thing but not every case is provable. Some cases are probably provable but not a slam dunk and in those cases where they are probably provable if a prosecutor is hamstrung so they can not have any flexibility in what they do with that case then the General Assembly has probably put that case in a situation where somebody would end up getting less time then they might have ordinarily gotten if this wasn’t there,” said Stone. “If their case starts falling apart they have the option to nolle prosse and get another charge,” said Carrico. “Commonwealth attorneys that want to have a the prosecutorial discretion and want to oppose this are going to have to deal with those law-enforcement families when they do this,” said Carrico. “They have to step up and they have to prove this because the next time they need help who are they going to call they’re going to call 911 and that officer is going to help them they shouldn’t have to worry about them being harmed,” said Jaime. Jaime says this is the first of many steps in healing her broken family while sending a message to law enforcement and her children. Jaime says that faith was lost the October day her children realized they will one day walk the same streets as their father’s killer. “If you were in my situation what would you tell your children about accountability? Because, we tell them they have to be accountable but our laws are saying that they’re not and we have to change that,” said Jaime. “Lets be realistic, police are being targeted today you’re not just being randomly shot because of an incident they’re being targeted. We as a society are going to have to step up and say we’re not doing this and this bill sends that message,” said Carrico. Jaime’s ultimate goal is to making murdering a law enforcement officer a federal offense.